In the meeting of monitoring committee of INTERREG EUROPE programme that took place in Sofia (Bulgaria) on 13–14 March 2018, 54 project applications out of 234 were confirmed for the third call (1 March–30 June, 2017). One of them is called Sustainable Tourism for Attractivity of Riverside Cities (STAR Cities) From June 1, together with Val-de-Marne tourism board in Paris, Lazio region and Municipality of Rome, Hamburg, Romanian Ministry of Tourism and NECSTouR – the Network of European Regions for Competitive and Sustainable Tourism, the project is implemented by Kaunas 2022 as well. The aim of the Interreg Europe programme is to help the European regions to prepare and execute their regional policy. Implementation of this measure would enable a more successful exchange in experience, knowledge and good practice between different European regional partners and interested parties. The aim of the STAR Cities project is to develop river tourism in five European cities and their regions: Bucharest (Romania), Hamburg (Germany), Kaunas and Kaunas district (Lithuania), Rome (Italy) and Paris – Vald-de-Marne (France), and make them more attractive through raising awareness about the natural and cultural heritage and development of sustainable tourism. Through this project, each partner aims at improving implementation of policy areas and programme implementation related to regional development, especially increasing employment, economic growth and investment. During the first three years of the project, project countries-partners will organise and interregional training activities, in order to determine the best cases of cooperation practice. Within the two-year period of project implementation, each region will implement an action plan to improve a political instrument. In the activities of these stages, i.e. the participants of this meetings and events will include the stakeholders from the public and private sector and those activists who act on a voluntary basis. 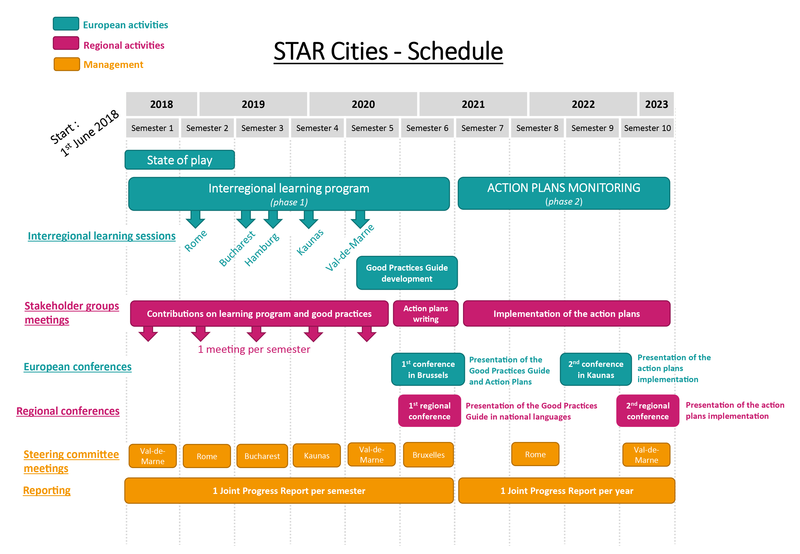 STAR cities is implemented for five years, from 2018 to 2023. It is funded by European Regional Development fund (ERDF) INTERREG programme in Europe (3rd call). The project received a European subsidy of 1 million Euros. Together with some of the project partners, Kaunas and Kaunas district is also a member of Riverside Cities European network, connecting local regions who want to improve and change the traditional cultural and / or economic activities in cities next to rivers or water roads. The aim of network participants is to raise awareness about this alternative for traditional tourism in the European cities. It is planned to approach the management board of European Cultural Routes programme of the European Council as well.